Given recent events, this is probably the most important Black History Month in years, and sadly the first time we've been deprived of Obama's amazing BHM speech. Every year, companies and famous faces do their part to promote racial equality and highlight racial issues in the US, or at least the ones that give a damn do. Twitter, as it's been proven many times over, give a fairly sizeable damn, but this time they've really hit the ball out of left field. 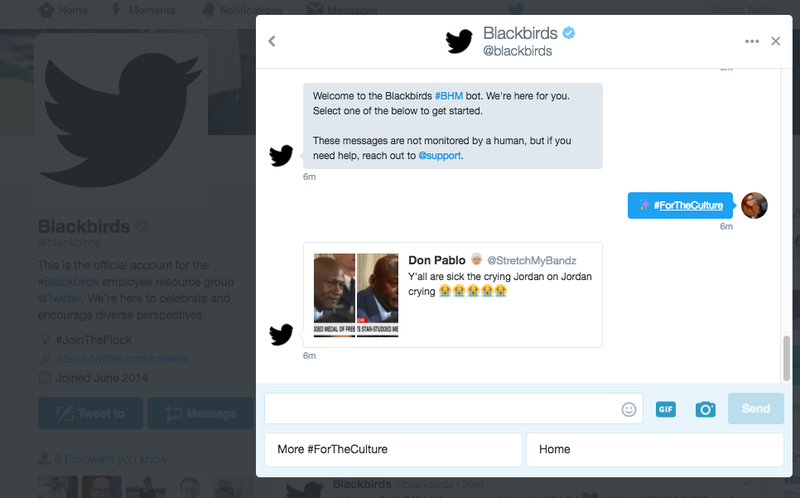 Twitter have a resource group for black employees called Blackbirds, and on February 1st it launched a chatbot, which, you guessed it, is named Blackbird. All you have to do is DM the official Blackbirds account and you'll be given four options - #BlackHistory, #SelfCare, #ForTheCulture and #ForTheCause. Select Black History, and you'll be given an 'on this day' fact, choosing Self Care will provide advice about how to look after yourself as a member of the black community, particularly in a hostile environment. Culture and Cause, meanwhile, will show you content from notable black creators and highlight community support events across 5 major cities, respectively. The #ForTheCulture hashtag is the one that Twitter are going to be championing throughout the month, using it to highlight African Americans who are pushing things forward through activism, creativity or whatever else. It's a good angle, it doesn't feel confrontational, so much as celebratory, but defiantly so. Twitter has been a hotbed of racism in the past, but it's never shied away from officially supporting the oppressed. Their level of involvement with BHM is very encouraging, they've even brought out an emoji to go along with it, not that that should come as any kind of surprise.